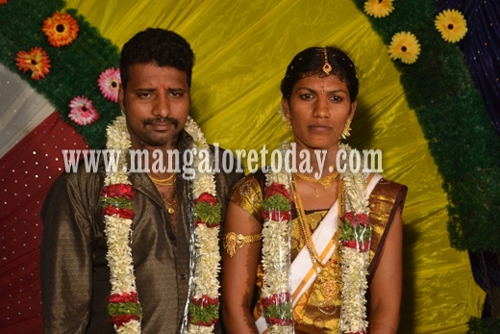 Udupi, May 15, 2015: Hundreds of guests who were present at the Rajalaxmi Wedding Hall at Manoor near Kota on May 14, Thursday were witness to a perfectly cinematic style, but real wedding. The only satisfactory aspect is that this story had a happy ending unlike in some films. The wedding of Shanker Nairi from Murukai Kota and Veena from Kirimanjeshwar was scheduled to be held there and relatives and guests had arrived for the Muhurtham. Just as the Muhurtham time neared there was a sudden twist to the tale when a woman named Saraswathi from Bengaluru arrived at the wedding hall accompanied by the Aravalli police and her mother and aunt. She claimed that she was the groom Shanker’s actual wife. When many in the hall were stunned and the groom Shanker refused to admit it, Saraswathi produced photographs of her wedding. The police took Shanker to the station where he confessed that he had married Saraswathi a year ago in Bengaluru. Back at the wedding hall, the bride Veena was in a state of shock. The marriage was arranged by her family with great difficulty and Veena who worked in a fair price shop had even availed loan for her marriage. Suddenly there came a good Samaritan in the form of Devendra who offered to marry Veena at the scheduled Muhurtham. Incidentally, he happens to be a relative of the accused groom Shanker. The bride’s family willingly agreed and the marriage took place and everyone present there heaved a sigh of relief. The couple are scheduled to visit Kollur to seek the blessings of the Goddess on May 15. At the police station, Saraswathi, the first wife of Shanker narrated her story in the presence of Taluk Women’s Federation President Radha Das. She said a missed call by Shanker blossomed love between the two and their four years of courtship ended in their marriage at Munishwara Temple in Bengaluru a year ago. Saraswathi who used to work in a garment shop, however quit job after marriage. Shanker who worked in a press in Manipal used to visit her often. Recently, when Saraswathi realised that Shanker was not in touch with her for some days, she contacted one of his colleagues and learnt about his second marriage plans. She wasted no time and lodged a complaint at Aravalli Police station and arrived at the wedding hall along with the cops in the nick of time. It is learnt, the marriage rituals of both Shanker and Saraswathi are expected to be performed again in the presence of family members.